The first entries for the 2019 Goffs UK Aintree Sale, which has produced three Grade 1 winners from just three boutique sales, will include two confirmed runners in the £1,000,000 Randox Health Grand National; Grade 1 winners DON POLI and OUTLANDER. 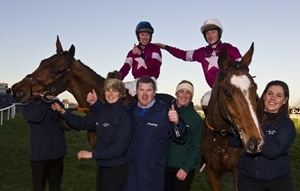 The pair are currently owned by Gigginstown House Stud, are trained by Gordon Elliott and will be offered at the Aintree Sale which will be held in the winners enclosure at Aintree Racecourse after racing on Thursday 4 April – the opening day of the Randox Health Grand National Festival. DON POLI, winner of eight races with three at Gr.1 level including the Cheltenham Festival’s Gr.1 RSA Chase and Gr.1 Lexus Chase at Leopardstown. Proven at Aintree having beaten Grand National winner Many Clouds in a Listed Chase and finishing second to Cue Card in the Gr.1 Betfair Bowl. OUTLANDER, winner of 10 starts with three at Gr.1 level including the Gr.1 Lexus Chase at Leopardstown and Gr.1 Champion Chase at Down Royal. Also placed second in last year’s Gr.1 Irish Gold Cup. Purchasers already registered with the BHA will be able to change the ownership and colours in time for the Randox Health Grand National two-days later. Initial entries for the Goffs UK Aintree Sale will be placed online at www.goffsuk.com later this week. For more information on the sale visit www.TheAintreeSale.com. To nominate your horse or register your interest in the sale, please contact Goffs UK on +44 (0)1450 372222.